I am writing this post in the afternoon of Easter Sunday. about a most interesting women, Tasha Tudor. A beautiful tea cup and saucer and daffodils. I have been fascinated by Tasha Tudor for years. she brought back this book. I said "how much?" She said, "one dollar" and I said "I'll take it." Now I own my first Tasha Tudor book. A sweet hankie from my mother's collection. These words are on the back cover. dreams can and do come true. The daffodils are blooming in the garden. solid color on the outside and beautiful inside. my love of books, tea cups and flowers. I also love Tasha Tudor and have collected quite a few of her books purchased at estate sales and thrift stores. It's amazing just how many books she wrote and illustrated. But the best thing was getting to tour her home last Fall. I wanted to slowly savor each room, but had to keep moving with the group. It was magical! What a great idea for a tea party. I love all things Tasha Tudor. I have several of her books and love to look through them from time to time. Thank you for sharing. I admit, sadly I have never heard of Tasha Tudor, but now I am intrigued! I am going to have to find her books. I love the special little vignette you did, your tea set is exquisite. Such a soft color palette, so beautiful! I always enjoy any post about Tasha and have many of her books. I have a circle of friends who adore her as well. I sold her books for years so I got spoiled but I don't have yours. Linda from "Lady Linda" blog is a real fan and went to the museum. I had another customer years back who visited her home. Have a great week. A beautiful display and post....I fell in love with Tasha Tudor as a teacher when I discovered her children's books. Very lovely vignette for Spring, I love all the cheerful yellow, and your retreat looks so cozy! Beautiful teacup, lovely vignette. And I love Tasha Tudor! I have many of her books, including this one. Your teacup is lovely, Betty. I have one Tasha Tudor book which I won in a giveaway years ago. Charming and filled with wonderful pictures and stories. I have daffodils in my vase this week too however mine came from the grocery store. There are no daffodils or tulips growing here at the moment. Soon though. Thank you for sharing with us and your Easter Sunday sounds lovely. You've piqued my interest in Tasha Tudor! I'm also loving your butter yellow teacup! Betty, Great to find a book you wanted. Great memory of the woman at the sale. Love the daffodils inside the cup. Thanks for sharing. Sylvia D.
I was introduced to Tasha Tudor several years ago buy a dear friend and a visit to the Indianapolis Museum of Art. They were having an exhibition of her art. Then just two years ago I received a cookbook with recipes of hers in it. This post is just a delight! Thank you! What a wonderful tribute to Tasha Tudor, a remarkable woman. Lovely tea cup too!! I too am a fan of Tasha Tudor, the life she lived, her books, her animals and how she celebrated Christmas.....truly remarkable woman. Betty, what a beautiful tribute to Tasha Tudor. I saw a photo of her the other day on Tumblr--she was in her garden, petting one of her cats. Whenever I think of TTudor, the sun shines a little brighter. This is so, so pretty! Everything just fits in so well; the book, your cozy room (I'd love to curl up with a book in that spot! 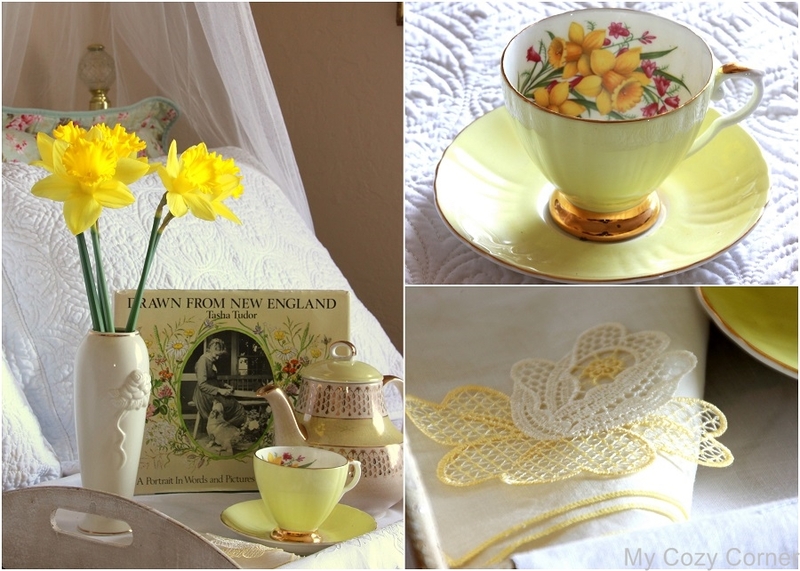 ), the yellow tea cup and the daffodils. . .so very pretty! Betty, what a lovely room and tea tray setup! Would love to look through your new book while drinking a cup of tea. Beautiful way to spend an afternoon! Your tea tray is lovely as is your guest room. Thank you for sharing your thoughts on the book. I agree, the tea cup is very beautiful. Daffodils are like sunshine! Such a pleasant afternoon in your lovely guest room. I so enjoyed reading this information on Tasha Tudor and your beautiful photos and quotes. A joy to visit you and we all thank you for joining us at Thoughts Of Home On Thursday. Oh, I am a fan of Tasha Tudor! Love it! Thanks for sharing at HSH!